I often think my children aren’t that good at playing but when I look in their toy box I can see why. It’s a complete jumble of mixed up toys which all look very uninviting. I’ve realised that at their young age they often need a prompt or some kind of encouragement. When I worked in nurseries we would always set out the toys before the children arrived and make the activities look as inviting as possible. This is now something I intend to do at home a lot more. I set up our first play scene today based on one of our favourite places – the beach. I put large and small pebbles and shells at one end and a pile of sand with a ‘bucket and spade’. I filled a tray with water for the sea and added some blue glass pebbles. I included some small figures to play on the beach. Unfortunately we don’t have many little people but Mr Tumble seemed to enjoy his trip to the seaside! Both the monsters enjoyed playing with this especially once The Limpet decided to mix the sea in with the sand. I will definitely be setting up more imaginative play scenes for them to explore in the future. 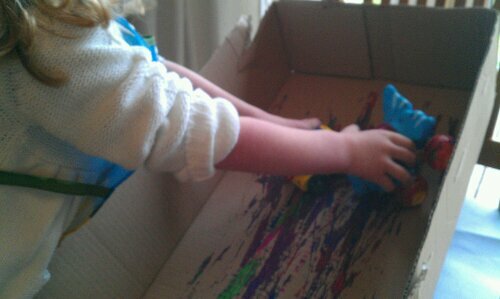 I’ve read a number of blog post about how great playdough is and how children play with it endlessly. Up until recently I had not been at all convinced and neither had The Limpet. I have always got the playdough out and then given her the usual tools – plastic knife, plastic scissors, plastic cookie cutters etc. She would play for a while, particularly if I also sat and made things with her, but she has never seemed that enthralled by it. 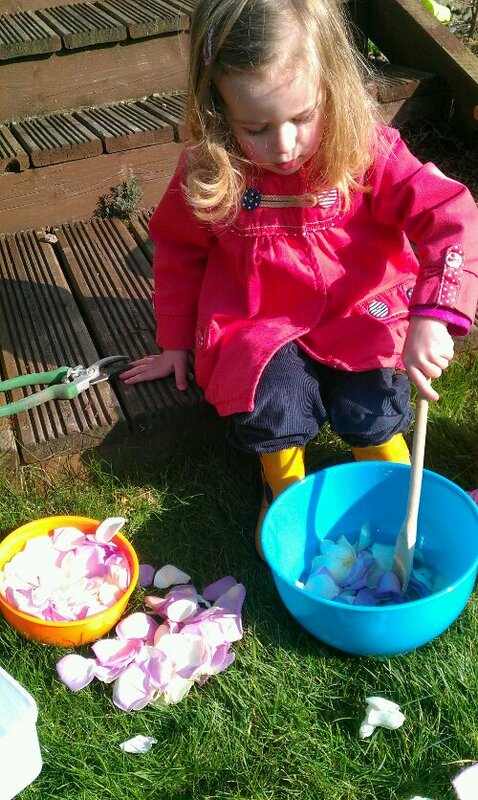 That was until I gave her some natural items to use with the playdough. With the help of some pebbles, shells, sticks and pine cones she was entertained for ages. This brightly coloured shop bought playdough was a gift. Before we were given this I had started making my own and intend to do so again. The homemade version feels so much better. I’ve also been reading a lot lately about the benefits of ‘loose parts’ in children’s play. This was a great example to me and I’m slowly beginning to realise that children play best when they are given materials (generally natural ones) that allow for open ended play. I’m slowly starting to realise (and accept) that when painting with a two year old, no matter what activity you plan it will always result in hand prints. And another realisation – washing the paint off your hands in a bowl of warm bubbly water is even more fun than the painting activity. I haven’t written much lately about what we’ve been up to and since a lot of it has been making a mess of one kind or another, I thought I put it all in one post. The first adventure we got up to was playing with ‘gloop’. 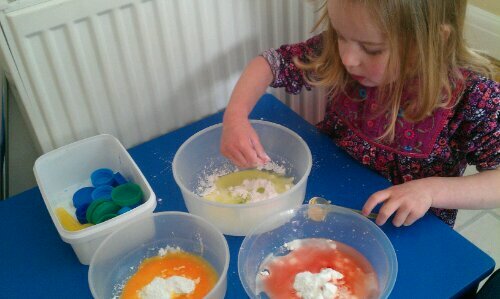 This is just cornflour mixed with water and creates a bizarre and wonderful sensory experience. 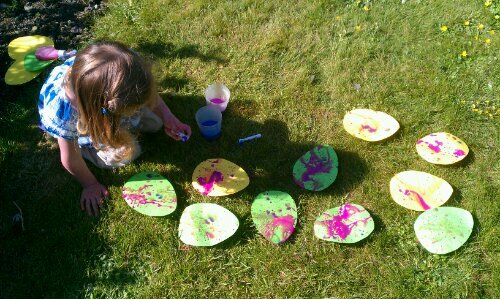 We had three bowls on the go and added a little bit of food colouring to make each one different. We both had such fun playing with it that I decided to keep it for the next day. It was actually a few days later that we went back to it, by which time it had completely dried out and was solid in the bowl. But strangely enough my daughter almost had more fun with it like this. She loved chipping away at it and crumbling it up. 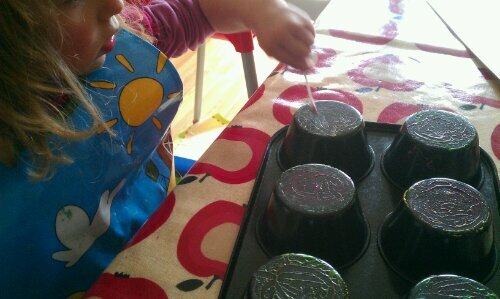 We also tried muffin tin printing which I have seen on pinterest. Initially this didn’t seem to be going well as the paint didn’t go on very well to my non stick pan. But my daughter (who obviously didn’t know or care about how it was ‘meant to turn out) had great fun swirling the paint round with a cottonbud. The finished prints were also rather good. 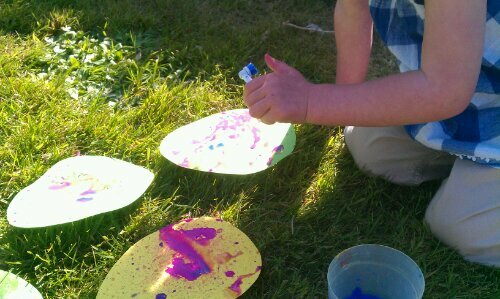 Our next very messy activity was spray and splatter painting to create an Easter egg garland. Due to the lovely sunny weather last week we were able to do this outside. This was a good job due to the mess we made. 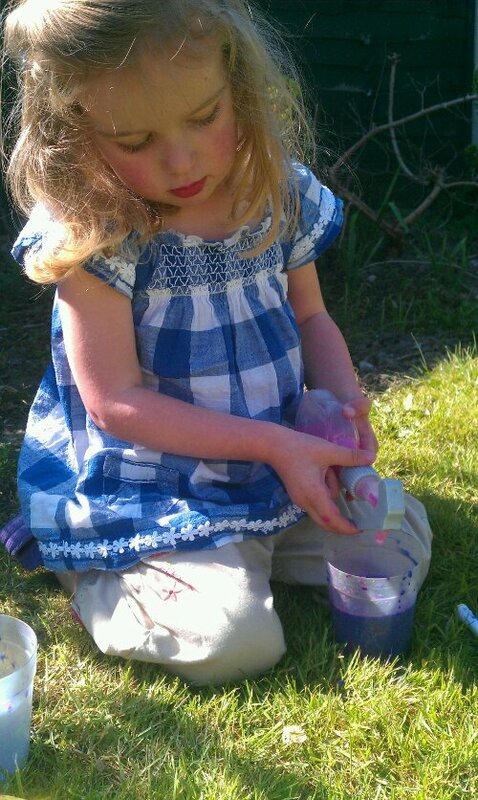 I put very watered down paint into an old spray bottle and showed The Limpet how to use it. It took her a few goes but she eventually mastered it. 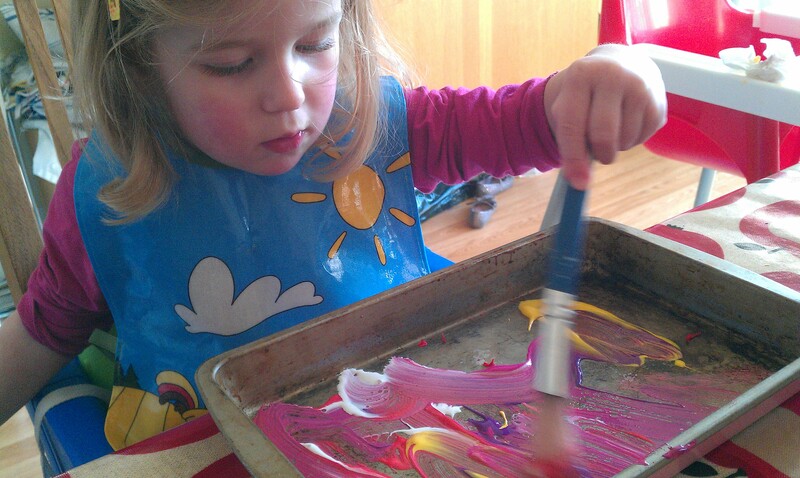 We also used toothbrushes to splatter more colours on. When we had finished we left them out in the sunshine to dry. I then sewed through them and they are now strung up in the dining room ready for our big Easter birthday party for The Gannett. We have recently purchased new shelves so had the lovely long cardboard box to play with. 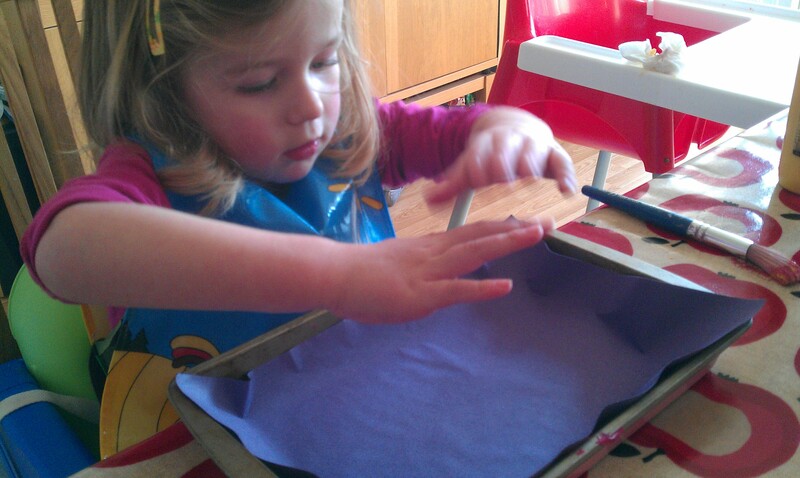 We’ve had fun sitting it in and being dragged through the house but I also wanted to do some crafting with it. I got The Limpet to search through the toy box to find anything with wheels. We got a selection of five different vehicles (I didn’t want too many as I knew the clean up job afterwards would be a long one). We then propped up one end of the box on a chair to create a slope. 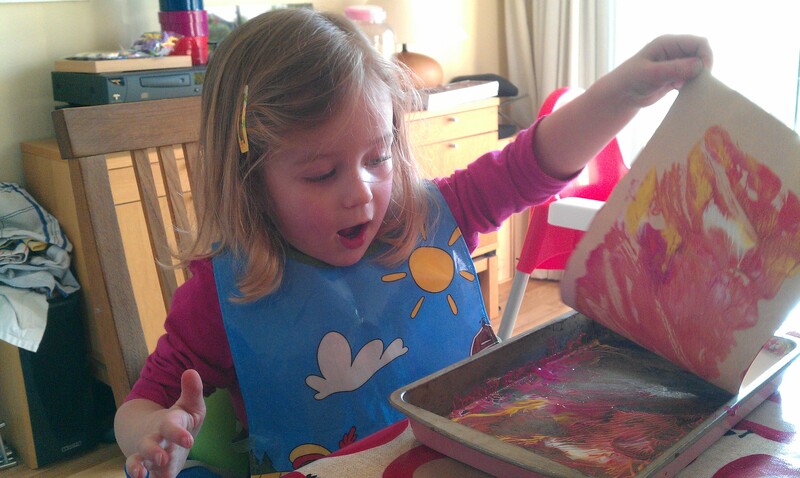 I bravely let me 2 year old pour her own paint into a tray. 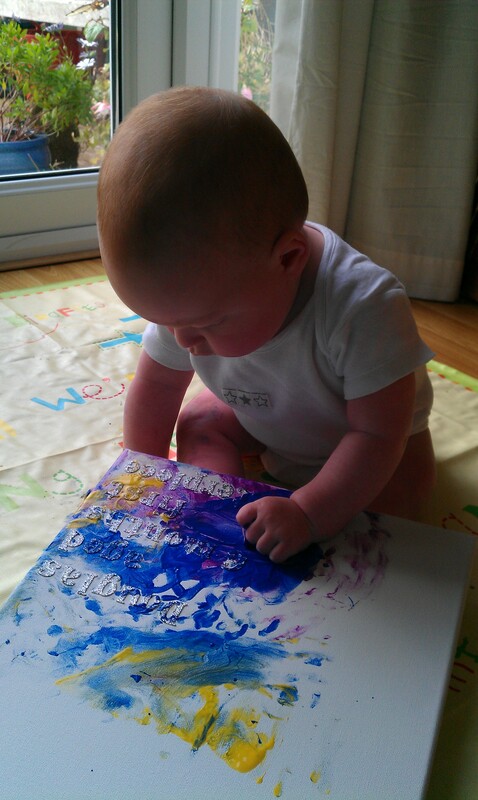 This is generally her favourite thing about painting with Mummy. 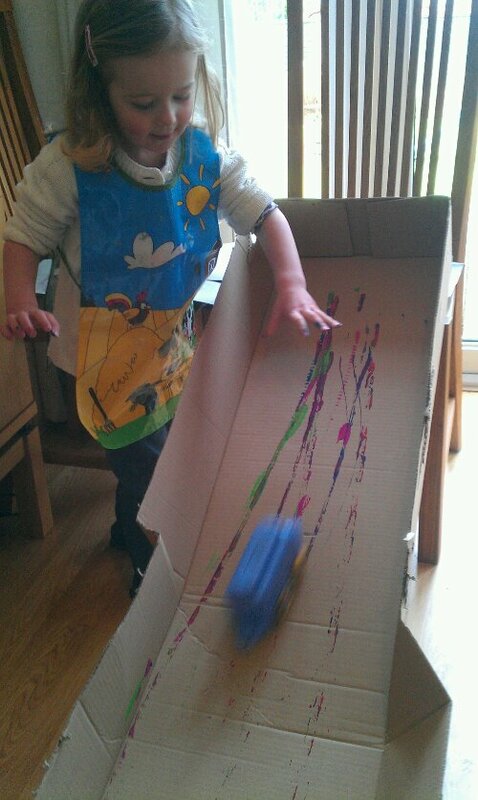 She then, without any explanation from me, dipped a car into the paint and rolled it down the cardboard hill. We both really enjoyed this activity and had fun selecting a vehicle and racing them down against each other. 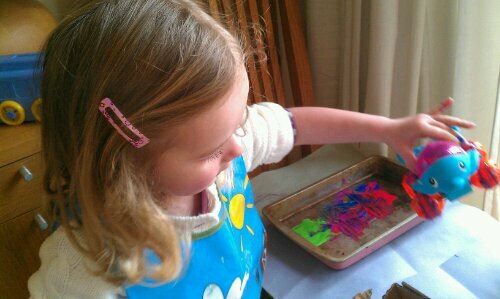 Sometimes she seems a bit uninterested in painting and creating so it’s good to find an activity that she really enjoyed. 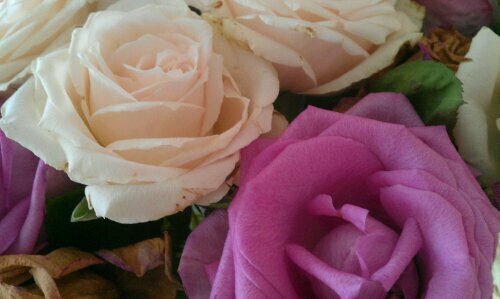 After just over two weeks, my valentine flowers have definitely seen better days. 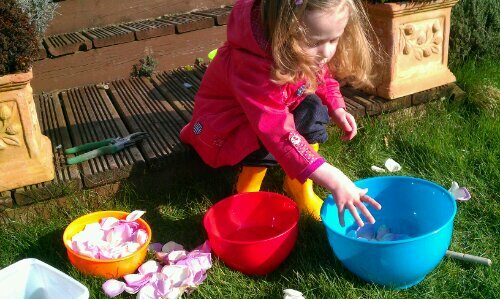 So on this gloriously sunny March day I decided that The Limpet could use the petals for some garden ‘cooking’. 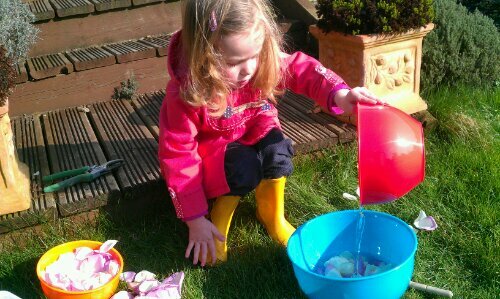 She currently loves helping mix things with a large spoon so I gave her a wooden spoon, a selection of colourful bowls and some water. She helped me pull all the petals off and then started playing. Even The Gannet got in on the action when he woke from his nap. 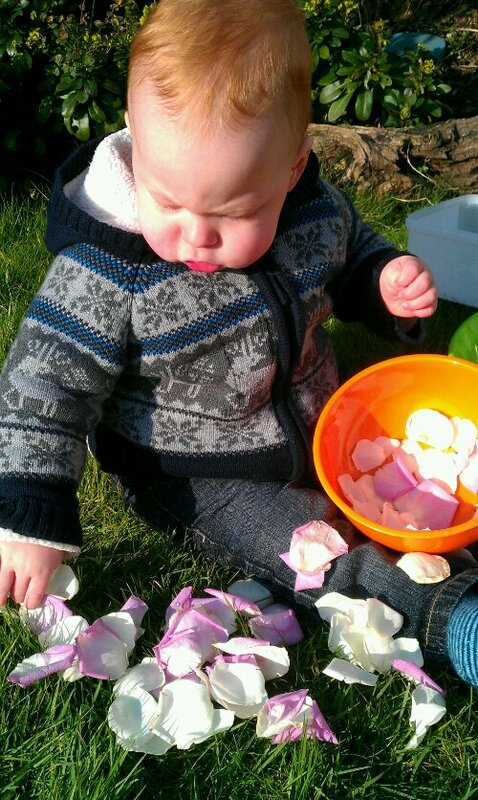 And amazingly he didn’t eat a single petal! Our non stick baking trays had lost most of their non stickiness so we went out and bought a new load. So with the old tins I decided to do some printing. We selected our colours, squeezed on a blob and mixed it all round with a paint brush. Then we got our paper and pressed it into the tin, patted it down to ensure it was fully covered and pulled up to review our print. 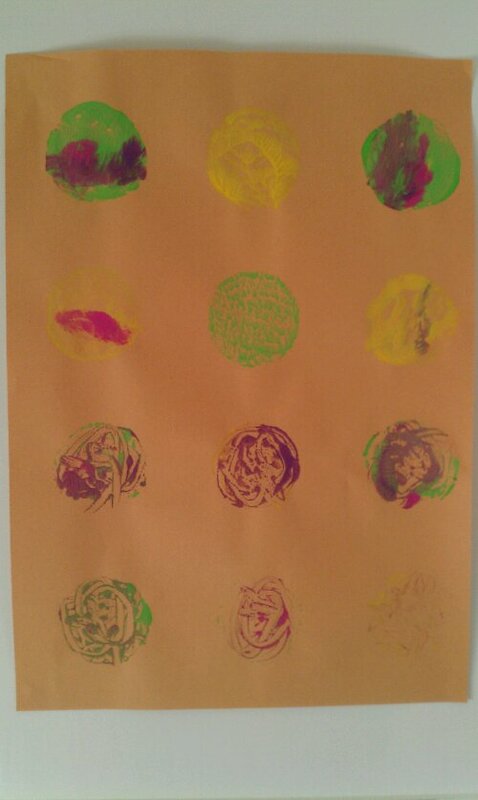 This proved to be one of our more successful creative activities and resulted in 11 different prints. Normally these type of activities last about 5 minutes so I was quite pleased. I did this activity a while back with my son but wanted to post about it as it was so easy and resulted in an amazing artwork. I started with a plain canvas and some letter stickers. I worked out what I wanted to be written on the canvas and stuck on the appropriate stickers. I actually stuck them all on by starting at the end as I wanted the words to be positioned in the bottom right. 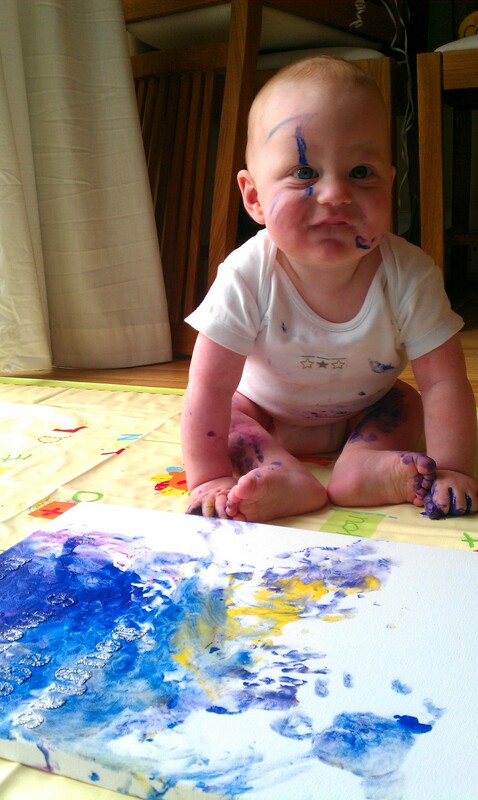 I then let my baby loose with the paint. 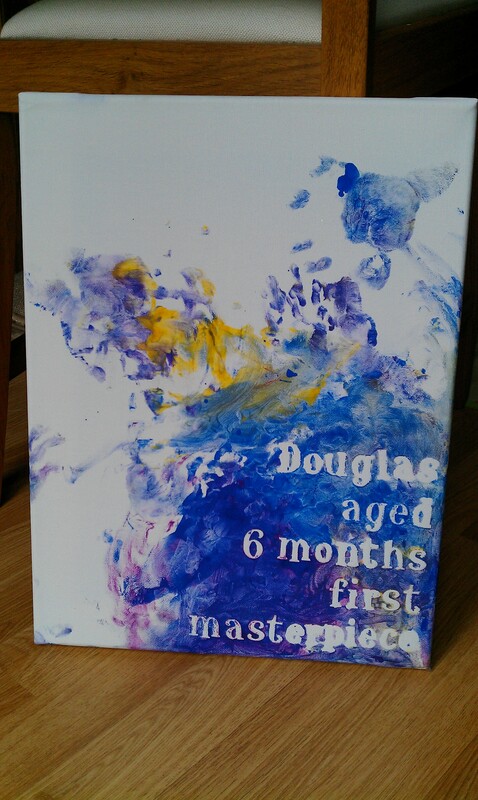 I put his hands in some paint and he just rubbed them all over the canvas himself. I did have beside me all that I thought I would need, bowl of water, cloths, towel, wet wipes etc. He’s a boy that attempts to eat everything so I was expecting the worst but surprisingly he didn’t put his hands to his mouth once. The only reason he has paint round his eye on the picture is because he wasn’t great at sitting unaided at the time, and when I took my hands off him to take a photo he fell head first into the paint tray!